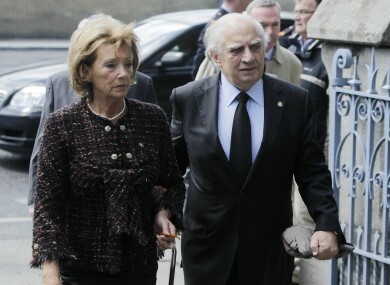 Peter Sutherland at the former Taoiseach's funeral in May 2011.
INTERNATIONAL BUSINESSMAN PETER Sutherland is to give this year’s Dr Garret FitzGerald Memorial Lecture at NUI Galway. The address, to be held on the evening of 31 January, will deal with European integration and the taming of nationalism. Sutherland and FitzGerald had a close working relationship, with the former Taoieach appointing the barrister Ireland’s Attorney General when he took office in 1981. Since then, Sutherland has served as a European Commissioner and is currently the chairman of the London School of Economics and the UN Special Representative for Migration and Development. Fitzgerald was a former Chancellor of NUI and the third-level institute established the series to honour a “leading statesman”. It is held annually at one of the NUI colleges. “We in NUI Galway are honoured to host the 2014 Memorial Lecture and look forward to welcoming Dr Peter Sutherland, a close and long standing friend of Dr FitzGerald, to campus for what promises to be a fascinating and stimulating address,” added NUI Galway president Dr Jim Browne. The lecture is open to members of the public. Those interested can register here. Email “Former AG Peter Sutherland to give Garret FitzGerald memorial address”. Feedback on “Former AG Peter Sutherland to give Garret FitzGerald memorial address”.